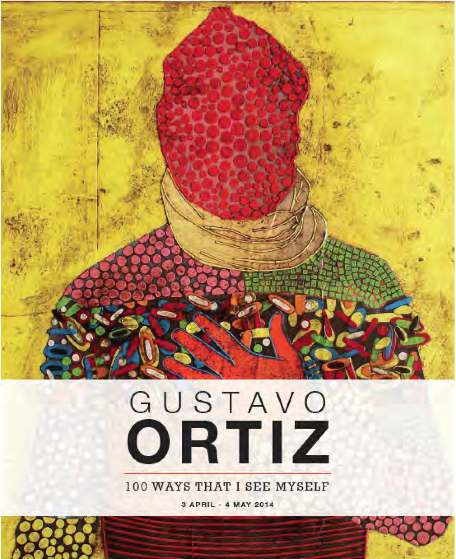 The Hundred Ways That I See Myself by Gustavo Ortiz. In Gustavo Ortiz’s artwork, the self-portrait is a recurring theme, always executed with a lot of originality and sensuality. The artist has many different faces, and we can feel this in his style with the material used but also through all the different forms he used to depicts himself: sometimes a cavalier, hidden beside a mask or as a monster. The artist combines gold leaf , deep red paint or lacquer techniques that literally transcend its mysterious characters in his quest to express different facets of himself. We can find in his paintings the sacred symbols of the Middle Ages, Russian Icon Paintings and the simple truth of naive art and South American legends. Gustavo plays with modern techniques of collage and bright, cheerful colours who come from the culture of his native land, Argentina, to express a just and raw vision of himself. Because of the multiplicity of the portraits, they touch us with emotion and affect the viewer as they can be viewed like catalysts. We could ask ourself if the main subject of this exhibition isn’t just a series of self-portraits, but also a mirror gallery thats reflect our true “self”, our humanity… To understand a little better this enigmatic artist, more than sixty exclusive piece of art will shown from the 3rd of April to the 4th of May 2014 in the Department store – Pure Evil Gallery.